Your pie looks so delicious, and I love the video! Thanks! This pie is so sweet it hurts your mouth. I love the AWW too, I recently heard Pamela Clarke speak and she was hilariously good value. This lemon meringue pie look awesome. Mysaucepan tried making it last week and the lemon bit was too watery although it tasted okay LOL. Ah this is a classic and you make it so damn well sweets! Loving the whipped cream tip. Your pie looks lovely, Lauren. I love lemon meringue pie. When I was little my mum used to make the White Wings pie – later when I tried making it from scratch I was like, woah! So that’s how it’s meant to taste. looks beautiful one of my faves. Ah the AWW – where would generations be without it? Good pie Lauren. The meringue looks fantastic. zomg that looks fantastic! love lemon meringue pie! I’ve seen that pastry in the local supermarket and have wondered about it… maybe I’ll give it a shot! 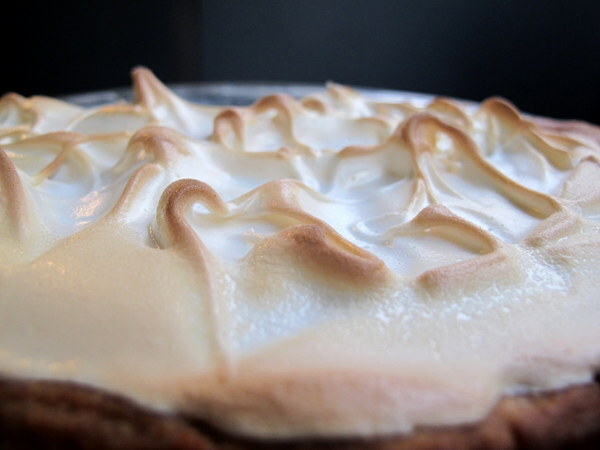 The meringue on your pie looks really nice and fluffy. I find that most desserts are so rich that they need to be served with cream or ice cream. I love lemon meringue pie, too! I’m glad to see your pie’s ratio of meringue to lemon filling. I like to really taste the lemon – how I hate all those pies you always see at cafes, with the scummy little layer of watery lemon stuff piled a mile high with meringue! Yours looks yummy. That lemon filling looks the perfect wobbly texture. Beautiful!! I hated meringue as a kid (weirdest kid ever, right??) so I’d just scoop out the tangy lemon butter and leave the meringue. Now I see the joy of the two of them together. This looks CRAZY good, such perfect layers! I have so, so much love for those AWW cookbooks. Wow! I love lemon meringue pie! I think I’m going to try a persimmon meringue pie soon. I love persimmons, but never tried them in a dessert. Do you think it will work? Michelle Elliott (@mschefkitchen) recently posted…Can’t cook? Yes you can! Lemon Meringue Pie is my most requested dessert on my cafe. People just love how it tastes in their mouth.